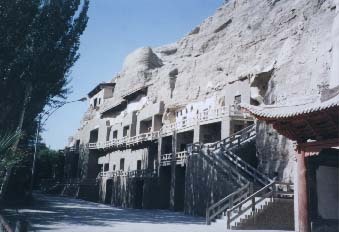 The Mogao Caves ( also known as the Caves of the Thousand Buddhas, the Mogao Grottoes or the Caves of Dunhuang) form a system of 492 temples near Dunhuang, in Gansu province, China. They are artificial caverns with a length of 1,600m. Most of the cave have three or four levels, the biggest ones have up to 9 levels and extend from the foot to the top of the mountain. The 16 biggest caves have a size of 268m² each. The caves contain about 45,000m² of murals and 2,415 painted clay figures. They show the illustrations of Buddhist sutra, Jataka (very popular stories of former lives of Buddha), venerable images, and donors. They contain an immense store of manuscripts, including the earliest wood block-printed text.